For millennia, two groups of immortals have roamed the earth in a spiritual chess game for human souls. Now they enter the time of Final Vengeance. On one side are the Collectors--unholy, undead entities who feed on misery and blood. In opposition are the Nistarim--saints raised from their tombs during the Nazarene's resurrection, who work to protect mankind. Natira, a powerful Collector infused with Judas's blood, is on the verge of finding the last of the Nistarim. To destroy them all in one master stroke, he must find the Nazarene's Crown of Thorns which is believed to be buried near Jerusalem. But the Nistarim have a potent weapon of their own, a boy who carries immortal blood. He has been hiding and waiting until now, when both sides collide in a battle of biblical proportions at Israel's historic Valley of Bones. The Jerusalem's Undead Trilogy takes readers on a riveting journey, as imaginative fiction melds with biblical and archaeological history. Valley Of Bones 3 by Eric Wilson was published by Thomas Nelson in May 2010 and is our 10200th best seller. 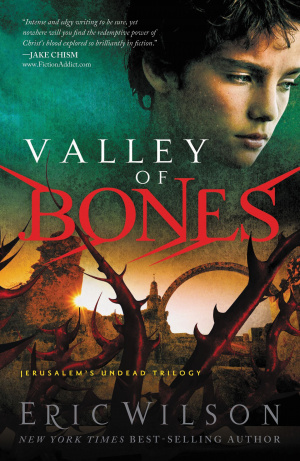 The ISBN for Valley Of Bones 3 is 9781595544605. Be the first to review Valley Of Bones 3! Got a question? No problem! Just click here to ask us about Valley Of Bones 3.